The difficulties of being a wildlife photographer. Wildlife photography while stood on a boat as you can imagine has some advantages and disadvantages. 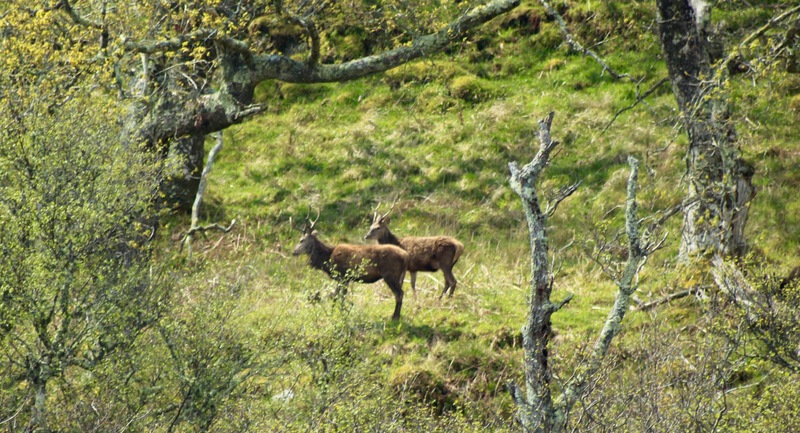 When going along next to the islands you can definitely get much closer to the different species living on land than if you had walked towards them trying to get a photo. The animals seem to be curious about the boat rather than seeing it as a threat so species like Red deer will stand and stare which makes for a great photo, of course the wildlife doesn’t always stick to the script and instead of being curious just ignore the boat altogether which gives a much more natural feel to the photographs. Customers photographing a common seal. Another huge bonus of using a boat to take photographs is the varied amount of wildlife you get the opportunity to see, from Red deer to Wild Boar on land, White Tailed Sea Eagles, Gannets and Golden Eagles in the air and from Common Seals to Bottlenose Dolphins in the sea. When you also add in the amazing landscape there is endless opportunity for capturing moments. 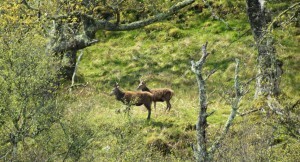 Red deer are often spotted on our trips. The main problem with capturing good photographs is the movement of the boat, using a tripod on board is out of the question as any movement of the boat will also move the camera so getting used to taking the photos from hand is a must, this way you can track your subject much easier as it moves across the landscape or through the water whilst also trying to counteract the movement of the boat. A skill much more difficult when you take into consideration you should have three points of contact with the boat so sitting or leaning against something is the best way to combat this problem. 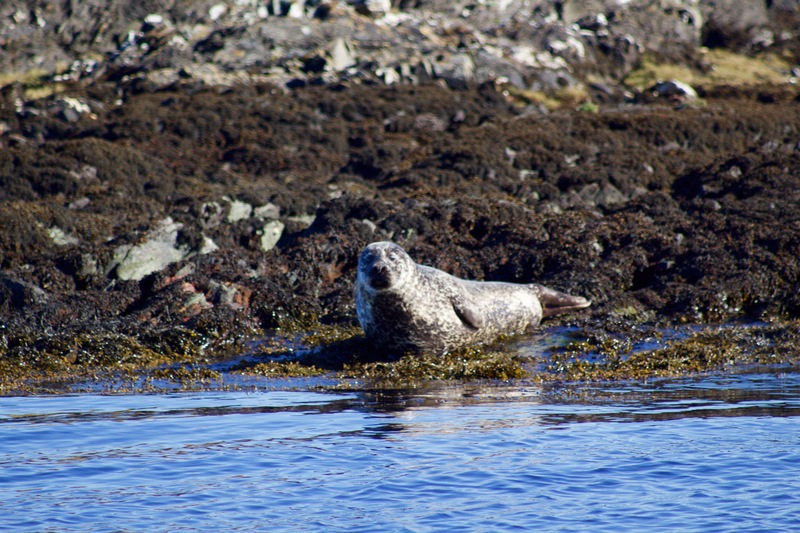 Getting to go out on the boat every day taking photographs also helps with keeping tracks on certain wildlife for conservation reasons, we work with the Hebridean Wildlife And Dolphin Trust and send them all our records when we get Cetacean sightings with any photographs we have taken. This helps with their records and to see how far certain species are travelling and any habits that they have. Posted in Blog. Tags: cetaceans, dolphins, wildlife on May 16, 2017 by Claire Davis. 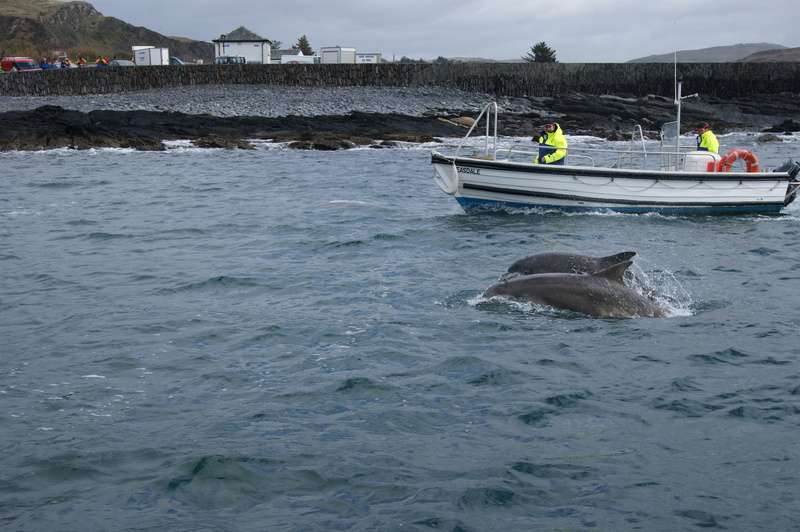 Last week here at Easdale we had a rare and wonderful moment when bottlenose dolphins came to play in the sound, much to the excitement of the new crew. As if by prior arrangement they were there in time for Roy’s morning Corryvreckan Wildlife Tour, Carolyn was also on board, whose reputation as a cetacean repellent can no longer be held against her, whilst Sarah and Claire were in the shop. The call came over the radio and permission was given to shut up shop and view the action from the harbour, so after a frantic scramble to find the keys, which turned out to be in Carolyn’s trouser pocket, Team Seafari were either on the jetty or on the boat to enjoy these fantastic animals doing their thing. 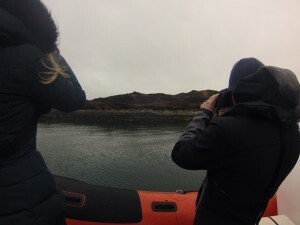 The Easdale ferrymen were also getting first class seats to the performance as they sailed to and fro with delighted passengers on board, and kayakers from Sea Kayak Scotland had the enviable experience of being within touching distance. If the crew had been on a day off they would have been throwing themselves into the water, wetsuit or not. Dolphins playing with Easdale ferry. There were 5 or 6 dolphins, apparently in the sound for the mere enjoyment of playing amongst the boats, ‘bow riding’ in the slipstream and following the ferry right in to Easdale Harbour at one point. They must have seemed trained to our Seafari customers, as they were there again for Sarah’s afternoon trip, and made another boatload of people very happy. Claire, on the other hand, was still in the office feeling rather put out, particularly as everyone was very vocal about how wonderful it had all been. Luckily for Claire, the pod stuck around for a few days and were seen off the west coast of Lunga whilst Claire was crewing the tours ! Crew member Sarah with dolphin. 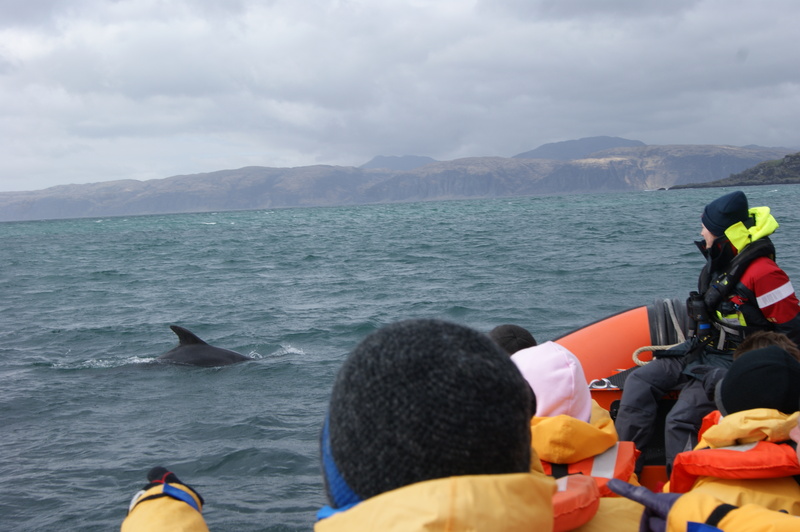 Bottlenose dolphins are widely distributed around the world; they can be found in cold temperate waters to tropical seas, but Scottish ones are the largest and fattest of them all which will come as no surprise to those of you who have swum in our brisk waters. The Hebridean Whale and Dolphin Trust have identified roughly 28 individuals in this group, but as they are nomadic and can be found travelling from Islay to the North of Mull, it is difficult to judge the pod size exactly. 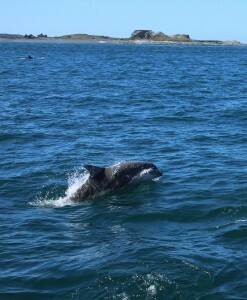 Individuals can be identified by scars and notches, particularly on the dorsal fin. 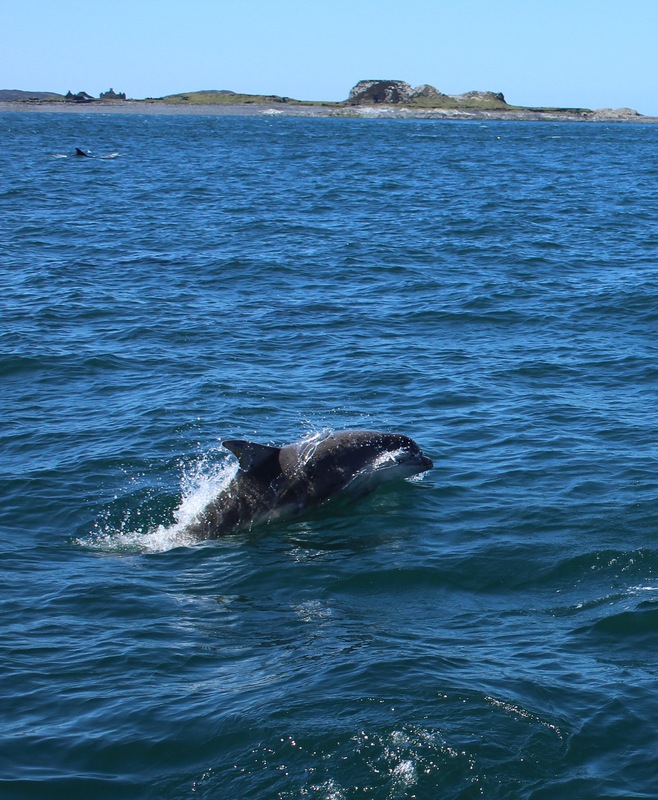 One dolphin in this pod was seen last June with severe propeller damage to the tail, and last week it was seen again by Claire and Steve, fully healed but with slightly hindered mobility – we reported the sighting to HWDT who are trying to get more information on this animal. 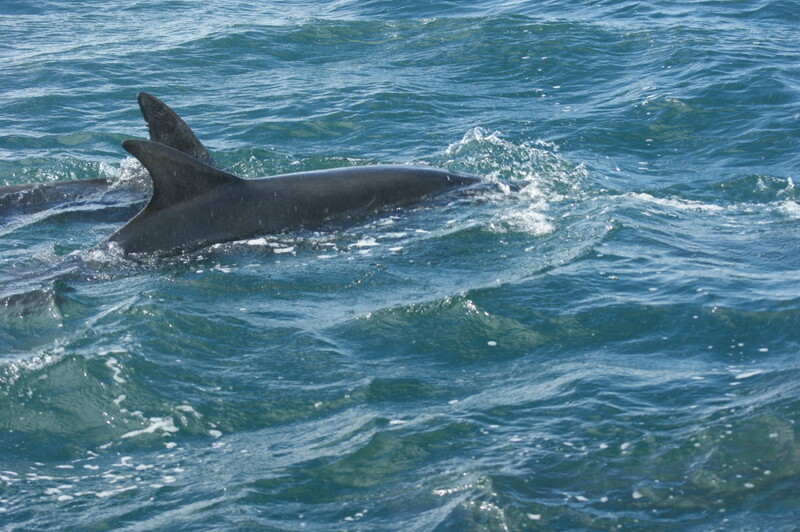 Example of dolphin fin unique scratches and nicks. Posted in Blog. 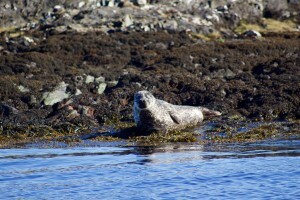 Tags: cetaceans, dolphins, easdale, wildlife on April 13, 2017 by carolyn.